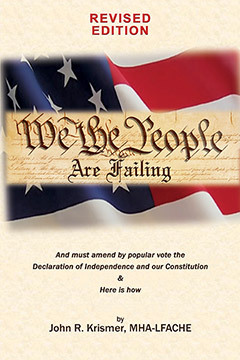 "We The People" provides facts and conclusions on how you can help to change the treacherous "Constitutional Crisis" the U.S. is in since the United States first established itself as a world leader based on its amazing twentieth-century advancements in Industrial Technology. In diagnosing today's dysfunctional Senate and House of Representatives, it shows that the plutocratic, corporate, and lobbying factions have for a second time replaced "We the People." This Multi-party conflict had previously occurred in the aftermath of the War of 1812–1815, fought between the United States and the United Kingdom, causing the collapse of this country's first Multi-party Federalist and Democratic-Republican regimes. History suggests that post-war industrial growth has a great deal to do with the wealth and corporate factions taking over democracies. The selfish, bitter partisan dispute between the Duopoly "Multi-party" U.S. Congress in 1812 had previously brought this nation to a "Constitutional Crisis," just like today - prompting the need to recover the people's "Single-party" identity from 1812 to 1850, which became identified as the "Era of Good Feelings." So this nation has previously experienced this need for national purpose and a desire for unity among all Americans. Worse yet, we now have a Russian foreign faction that is also intent on destroying all forms of democracy throughout the entire world by using their cyber espionage skills to interfere with the 2016 U.S. Presidential Election. Once you review the facts herein, it is my hope you will find your voice and then use it to speak out as a devoted and loving citizen of the greatest Democracy ever. John R. Krismer, MHA-LFACHE - is founder and CEO-PI of Health Systems Institute (HSI), consulting with governments, hospitals, clinics, and professional and political organizations while serving as CEO of several hospitals and corporations, and as a board member for two health insurance companies. He's conducted hundreds of educational institutes and researched the health record database system with four major universities, which proposed a comprehensive universal non-profit single prepayment system to provide cost-effective, high-quality care that was to be led by healthcare professionals who work under a Hippocratic Oath ? not plutocrats that only seek wealth. He's often identified as a visionary ahead of his time, who openly opposed profiting from this nation's sick and disabled, and fought decentralizing and deregulating this county's healthcare under profit insurance and pharmaceutical companies. He supported this country's once very successful single privately owned non-profit healthcare system before it was invaded in the 1960's by non-medical politicians to increase their financial benefits. A system that was once ranked first in the world instead of 32nd by today's World Healthcare Organization (WHO). In discussing political concerns with President Ford, (a close friend), the President said: "John, our politicians have a stranglehold on this Democracy, and the healthcare system will have to collapse before it can get better." And you know what? He was right! Unless the people review the facts and speak out in a single voice and demand equality as they did in the "Era of Good Feelings," our Democracy will collapse. It is my hope this book will help you learn the facts and how to speak out.